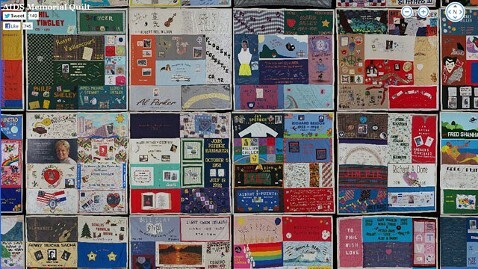 With more than 48,000 panels and 94,000 names, the AIDS quilt is a constantly growing testament to the deadly toll the disease has taken on the world. At roughly 1.3 million square feet, it is so large that it can’t be displayed in its entirety in one place. Parts of it were on display at the National Mall in Washington DC in late July 2012, with volunteers constantly switching sections in and out. However, there is one place with enough room to hold the entire quilt: the Internet. Microsoft Research, working with the University of Southern California and the NAMES Project Foundation, which uses the quilt as a tool to raise AIDS awareness, have created a map of the entire quilt using Bing mapping technology. The map is fully zoomable, allowing users to zoom out to take in the full scope of the AIDS epidemic or zoom in to look at a single one of the 94,000 names, each painstakingly created by the family or friends of a loved one who died of AIDS.